Family-friendly Anjungan Beach Resort & Spa is tucked off the northern end of the main seaside road of Teluk Nipah. Average rating 7.4 from 2,387 reviews. Unlike other Nipah hotels, Anjungan’s well-maintained, spacious grounds are bordered next to the dense jungle, creating a nice buffer zone from neighbourhood acoustics. Their landscaped grounds also include a large boat-shaped pool, with a centrepiece inclusive of a jacuzzi in the boat’s bow and plenty of umbrellas and sun loungers to go around. With upstairs and downstairs suites available, the airy rooms are downright luxurious considering their relatively low rates. Besides large plush beds, hot-water showers, mini-fridge, electric teapots, flat screen TV, closet space and a private veranda, they also throw in breakfast for two. Their open-air restaurant also serves as the reception and lobby area with WiFi available. Nipah Beach and Coral Beach are both just a short walk away, with plenty of waterfront restaurants available. 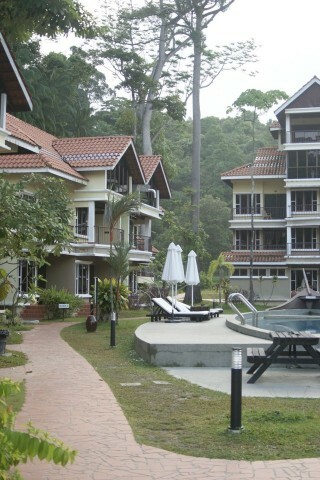 Check rates at Anjungan Beach Resort on Booking.com.